First things first, we've booked our photographer!! We are going to be working with Robin Fox Photography for our Wedding and Engagement photos, and I could not be happier. I really haven't been thinking about flowers that much. To be honest I've been thinking more about what the flowers will go in (mason jars, galvanized buckets, tied onto the chuppah, etc) than flowers and bouquets. But when my lovely MIL sent me the link to this list of 18 ideas for Alternative Bouquets, my mind started to work. I've never thought about an alternative bouquet, but there are some amazing options on Pinterest! I'm still pretty set on having flowers, but I would love to include a little bit of an extra creative element to it. Just something a little bit special. Also, I love that most of these creative elements can be kept forever as a keepsake! What do you think? 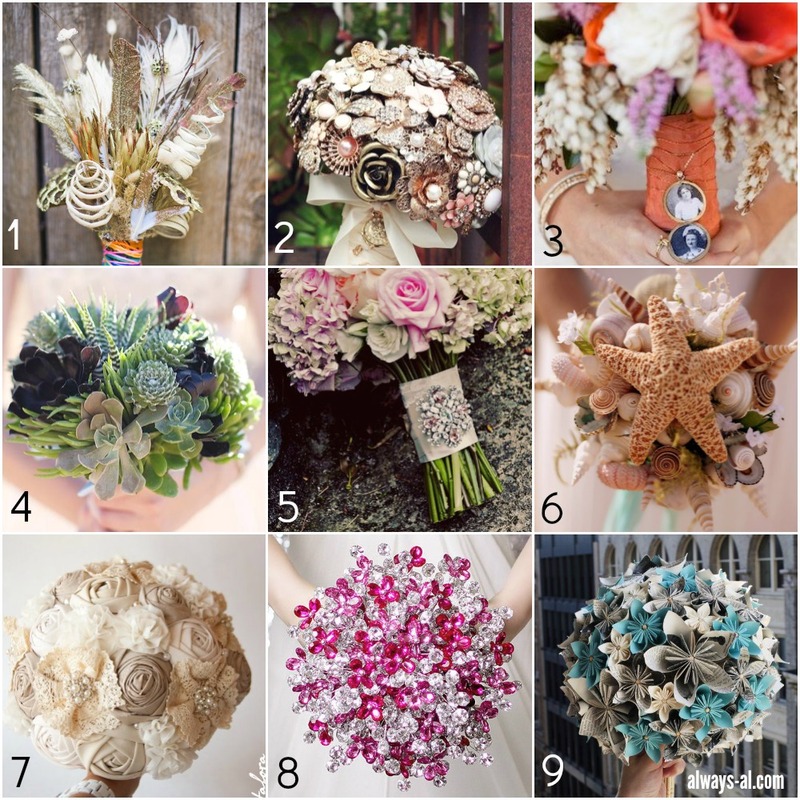 Would you ever include an alternative or creative element in your wedding bouquet? Do you think this would make a good keepsake? ***There are only a few days left to enter for a chance to win $125 to Kate Spade! If you are a bride or are attending a wedding in the future, this is a giveaway that you don't want to miss! Enter here. I love these ideas!! One of my close friends getting married next year is doing a brooch bouquet. She has a bunch from her grandmothers, but I told her she should ask people at her shower to each bring one so they all have special meaning. Thanks for linking up with us this week! These ideas are so cool! If I wasn't so set on flowers for mine, I would totally do the seashell one. The brooch ones are getting so popular, I just can't imagine how heavy that can get! Those are all so different and creative. I love the spin on a classical bouquet! I think the brooch ones are beautiful for vintage-themed weddings. I've never seen the succulent, but I'm really liking it - for a certain type wedding, of course. They are all pretty. I always love the brooch bouquets! And the fabric ones too! I think a non-traditional bouquet would be a great touch! I seriously considered this for me wedding but because it was a destination wedding I opted against it. If my wedding had been local I for sure would have done this! Congrats on the wedding photographer! As a wedding and event planner, the photographer is one of the most important elements/vendors because they will capture your wedding day for your see for the rest of your lives! I like #3 of the bouquets. My daughter had a brooch bouquet for her wedding 2 years ago. It was really gorgeous! You can see it on my blog here, http://wp.me/p4fJXd-dj. Have fun with all your plans! Make it your own day and use what you love. Have fun.